In 2016, Section 6106 of the Affordable Care Act introduced a number of rules and requirements for long term care facilities to submit staffing information. 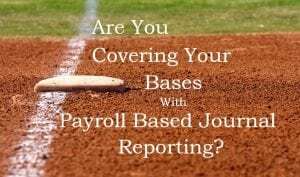 PBJ, or Payroll Based Journal, is a system used to report on staffing and census information to the Center for Medicare & Medicaid Services (CMS) to fulfill those requirements. Although the Affordable Care Act (ACA) and Payroll Based Journal reporting have been in place for a couple of years now, there are still some industry practices that can make complying with the regulations difficult. With all of the specifications the Center for Medicare & Medicaid Services is requiring, it can become tricky to keep everything in line. Luckily, Payentry can help ease the administrative burden relating to these regulations; find more information from Payentry, here. Below are a few of the most common things that can cause errors in your reporting and how our all-in-one solution can help you avoid those problems. Employees that perform different roles during the same shift. Payroll Based Journal reporting requires facilities to report on each caregiver’s hours worked, classified by a specific code. Sometimes employees work long shifts that require they perform more than one job in a single shift. CMS requires that worked hours be reported by a job classification code, so these employees’ time needs to be documented separately, even though it was the same shift. Payentry allows a quick, customizable setup of job classification codes. Once each employee has the appropriate code(s) assigned to them, they can punch in and out on our time and attendance application, Payentry Time Management, based on those job codes. The Payentry Time Management system is also fully integrated with payroll, so those hours can be sent to payroll with the click of a button. This reduces the likelihood of errors in reporting or data entry, making your life a little easier. Another requirement for reporting is that hours are recorded on the specific day they are worked, meaning the day ends at 11:59PM. However, it is common for direct care workers to have shifts that begin at night and last through the morning. Your PBJ file must record these hours on the day they occurred, so if a worker is scheduled 7:00PM-7:00AM, the hours of 7:00-11:59 will be recorded for one day and the hours of 12:00-7:00 must be reported the following day. When you use Payentry Time Management to push timeclock data to payroll, this stipulation is easily met. The system seamlessly timestamps hours to accurately report when staff is on site, automatically recording hours under the correct day. You do all the work and your PBJ file still has errors. With all of the information that is required to be generated for the final file, there is no doubt that some employees’ information may have been missed or not recorded properly. Payentry lets you preview the information in an excel format so you can quickly and easily identify any missing details or errors before submitting to CMS. Once you’ve viewed the preview file and verified the data, the xml file required by CMS is ready in mere seconds. To a facility with a large number of direct care staff, this reporting structure can seem like a daunting task. The above examples are only a few of the ways Payentry can help make the process more efficient and help businesses accurately report information. For more information on PBJ and CMS reporting periods and due dates click here to access the Center for Medicare and Medicaid Services. Answers to technical questions relating to your business can be found by accessing the QIES Technical Support office site, here. Lindsey Whitman is a graduate of the University of North Carolina at Charlotte with a bachelor’s degree in business administration. She has extensive experience in payroll operations and has maintained her FPC designation since 2016. When not finding the cheapest way to travel across the country, Lindsey is using her payroll industry knowledge to expand Payentry’s digital reach and captivate readers with her insightful approach to payroll and HR news.